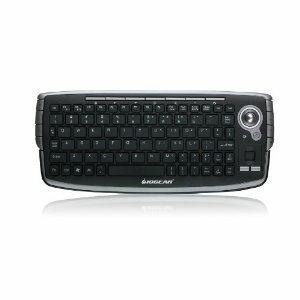 I am in the market for a wireless keyboard with built-in trackpad or trackball. I found the GKM681R which looks like the predecessor to the GKM561R , which has 4 stars on amazon. The GKM681R seems to have more features and addressed many customer concerns present in the older model such as lack of right click button and scrollpad. However, as of today there are no reviews of the GKM681R . keyboard today so hopefully I will be able to get a full review of it up soon. Update: I finally got the wireless keyboard. It is very nice. I really like the placement of the right and left click buttons. It is placed on the upper left and right of the keyboard, like the buttons on the xbox controller — you can’t see it in any of the images. It is extremely easy and intuitive to use. The keyboard will install out of the box. Just plug in the USB adapter and its up and running. No set up required. Amazing! My only complaint is the trackball is sort of sluggish, but that might just be mine, because the keyboard shipped to me with some abrasion around the trackball area. Also, it would have been nice if they included an “off” button for the keyboard for when you don’t want to accidentally press buttons. One thing I never understood is why people prefer to buy those media center boxes, like the the appletv and googletv, when getting a fully functional PC or mac mini with a wireless keyboard is so much more convenient and usable. I have yet to see a user interface that is better than my browser.